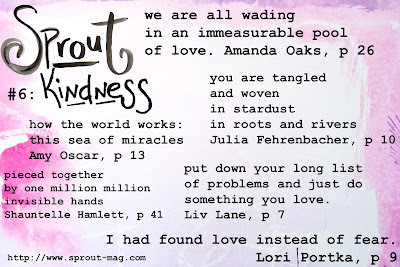 Issue # 6 of Sprout (an absolutely gorgeous online magazine created by Amanda Fall) is out! If you want to feel held and loved, if you want to know that you're not alone, I highly recommend you get a copy of this. Amanda puts her whole, beautiful heart into these issues. I feel truly blessed to be a part of such beauty. I'm breathing deep sighs of relief over here! The feeling of having my book completed has sent me into full-on celebratory mode. And this feels very kind. I am celebrating the completion of something but mostly I'm celebrating the me that continually showed up, even though I didn't know where I was going, even though I didn't know how, even though there was a ton of fear, even though I didn't have a map or a plan...I kept taking baby steps toward what sparked my spark. Tuesday night after I sent every last bit of my book to the publisher, I lit a candle, poured myself a glass of really nice red wine and just sat with myself. I sank into the couch. I smiled really big smiles. I wrote myself a long, beautiful love letter. There has been this tiny (almost inaudible) voice that wants to convince me that this isn't that important, it wants to undermine the bigness of this. But, here's the beautiful part. I'm not listening. I'm celebrating anyway! I'm allowing myself to cry happy, relieved tears of joy. I bought myself a big, vibrant, very alive bouquet of flowers. A couple of days ago I called my dear friend and we had a celebratory lunch date. It feels so good to honor myself in this way. It feels kind and kickass and necessary. And new. And now, the sun is shining. Time to get out there and breathe some fresh air. Each of you who came here and left your congratulatory words, thank you so much. They filled me right up. I hope you're doing something to celebrate yourself today. Have an alive, kind, joyful weekend, everyone. Yes! We will celebrate all kinds of things this summer! I love you, sweet sis. Julia!! I am so happy for you! Congratulations!!! That is amazing! You did it! I never doubted that you could. I cannot wait to hold your book in my hands and know that I can carry your beautiful words with me wherever I go. Grace. Your words always make my heart all warm & soft & open. Thank you for coming here and telling me just what I need to hear. More congratulations from me to you! And I bought my first issue of Sprout Magazine this last week and LOVED it! So glad you loved Sprout, Deb! Isn't it heart-filled? I love it. Thank you for congratulating me so sweetly. Congratulations! 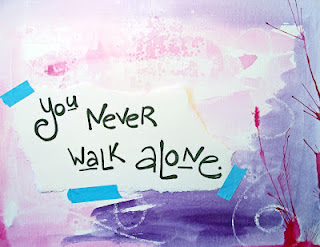 I love your blog...it is always an uplifting part of my day. I can't wait to see your book when it is published. You are an inspiration to your followers! Gail, these words mean so much. Thank you for taking the time to write them. So beautiful that you're giving yourself the gift and the promise of celebrating and honoring all of your hard work and efforts! Thrilled to be in such good company over at Sprout!!! Yes, Marcie, it feels good and empowering and long overdue. I have a tendency to downplay my steps forward, I'm not going to do that anymore! I'm learning that such expansion happens when we take the time to wholeheartedly celebrate our growth, our movement, our Selves, each other--life. Congratulations! Congratulations! What a journey, and this is so big for all of us! Thank you for practicing through and through living from the heart and walking bravely through the fear, not letting it get the better of you. I can't wait to hold your book in my hands and keep celebrating forever-more this profound birth! xo. was such a gift to celebrate with you! 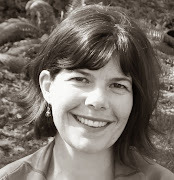 My friend, dear Brooke. Thank you for always being right here, for continually coming back to what matters most, for continually moving through and for always helping me to see myself more clearly. You are a treasure. LOVE this: It feels so good to honor myself in this way. It feels kind and kickass and necessary. And new. I'm smiling so big my face hurts. I am so very excited for you....for sending your baby out into the world, for honouring yourself and this very important process and milestone!